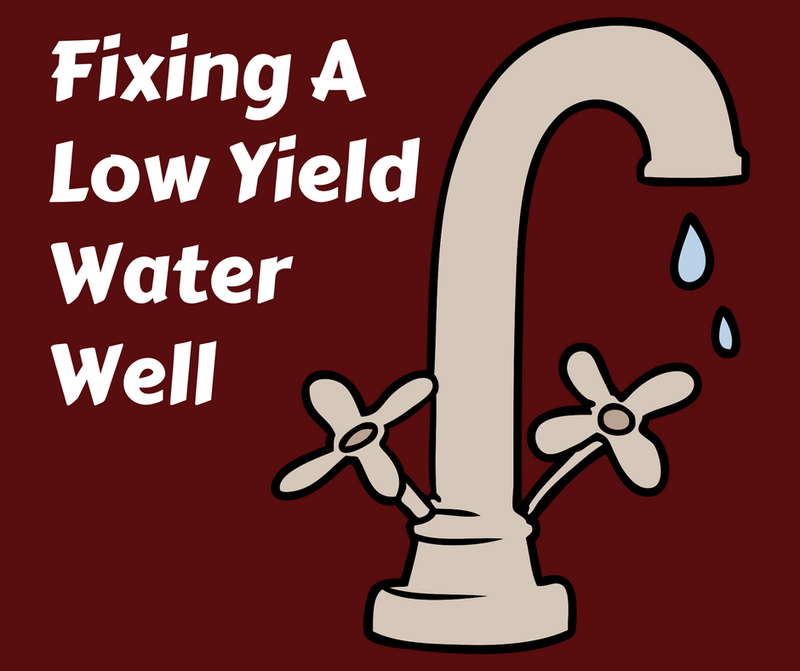 Reduced water pressure at your tap can often appear to be a sign of declining water well yield. However, before you jump to conclusions check any conditioning equipment hooked up to your plumbing like water softeners or iron removal systems have been properly serviced. Declining water pressure is not always indicative of a water well problem. However, lowered water levels and slow recharge may result in no-water at the tap or restricted flow. Low water pressure at your tap is typically caused by one of two issues. • Reduced water levels in your aquifer due to natural causes such as drought, or overpumping of the aquifer. Even if the well is still productive, lowering the pump may still produce reduced flow or lower water pressure. • Reduced efficiency due to some form of blockage around the drilled hole. Physical plugging may be increased fine sediment, sand, silt or clay. A buildup of scale as the result of chemical precipitation. Fouling of screens or intakes by colonies of bacteria, or algae. Blockages in inflows generally take several years to develop. If your well is not periodically maintained and monitored, the problem may be undetected and when finally discovered can be more difficult to repair. Determining the cause of any blockage is necessary for a proper solution to be applied. New water wells should be tested for water chemistry when first completed to determine a baseline for pH, hardness, alkalinity, acidity, iron, manganese and turbidity. The chemistry of your well is directly affected by geology encountered when drilling. When a well is pumped down, air may enter into the well to replace the water. The oxygen present can cause changes in the rock and increase the chances of chemical encrustation. If you experience reduced yield, your water well professional will lower a camera into the well to perform a survey. The camera survey is a permanent record of the appearance of open hole zones, and the well materials including the casing and screens. Typically, scale and biofouling (bacterial colonies) are also visible as well as the condition of the well components. The video can be compared to your original well log to assess any changes. This information can also allow your well water professional to know where to focus on “well cleaning.” Once the cause of any blockage is determined, a treatment method can be developed to remove any blockages or reopen fissures to regain some of the lost yield. Treatment for blockage typically involves the introduction of chemicals along with agitation of the water column to force the chemical into the aquifer and to scrub the affected well components to dislodge and remove scale and bacteria. Hydrofracturing in bedrock wells is a method that increases water pressure in the well to open new fissures in the rock. It can be effective in increasing yield from an encrustation blockage. In hydrofracking, several chemicals are applied to dislodge or dissolve any blockages. They can include detergents, acid, and biocides. The agitation method used can include alternating water jet and pumping cycles. Your water well professional will typically use a combination of methods. They will have the equipment, experience, and expertise to solve your water well problems. In most cases, the pump is removed. Rehabilitation is typically less expensive than drilling a new well and if local regulations include sealing the old well the costs can increase. The best solution is to discuss your options with your water well professional including costs. Your contractor will pull all of the necessary permits and will ensure that any procedure meets federal, state and local requirements, including storage and disposal of any chemicals used. Your contractor will also speak with your local Water Department to determine if drought or additional wells feeding off your aquifer may be the cause. If these two potential sources are ruled out, your contractor will go over the pros and cons of rehabilitation versus drilling and constructing a new well. At Skillings & Sons we're experts at resolving low-flow issues. If you've noticed a drop in water pressure in your home, or see signs of turbidity like cloudy water discharge from your faucet, give us a call. We can help you determine the best course of action for restoring your private water well's yield.